When I first met Cristina, she was a 7th grader who loved to touch fabrics. She was a sponge who happily absorbed anything I showed her about quilting and sewing. During her high school years she made several quilts in my studio. One summer I asked her to do this Fence Rail and model this pattern and sew it as grand daughter Nikki made her own Fench Rail. Cris found these fabrics in my stash and went to town. And then life intervened, and this quilt was never finished. I thought I would finish it for Christmas 2010 and give it to Cris. But then Ebony Love bought a long-arm quilt machine and wanted quilts to practice on. Am I the lucky one or what? Ebony just returned this quilt to me yesterday, and I am stunned at the density and fluidity of her quilting. 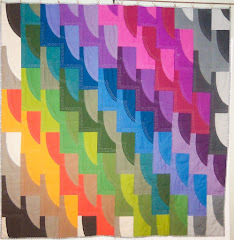 This quilt is beautiful, and her curvy quilting lines are a fabulous juxtaposition to the straight lines of this Fence Rail pattern. And Ebony's choice of thread color - perfect. A word about Cristina's outer border. I didn't like it when Cris chose it. And I still remember Cristina tell me it was something unexpected and that you sometimes just have to take risks. In hinsight? She was right. I think I wanted a brighter gold color for the binding. However, this yellow batik with the dots coordinates nicely with the border. Click on this picture to see the details of Ebony's quilting. Cristina is a sophomore at the University of Iowa and will be home for Spring Break in a few weeks. I can't wait to return this quilt to her! It's been a luxury to have the past three days clear to sew. After getting Christopher's quilt to the next stage, my time was free. And these two projects are ones I've been eyeing and wanting to start. My love affair with all things Jinny Beyer continues, and this table runner - although a fairly simply pattern - packs a terrific visual punch because of her fabrics. I'm trying to decide whether to use the piece of backing fabric as an additional border and thus enlarge the whole runner. The finished size is 12" by 60", but I wouldn't mind making it a bit bigger for our table. This purse has a design that I like, and I thought it would be simple to make. Wrong. Very wrong. What's making me finish this is that I love the batik of the outside of the purse and I also love the coordinating fabric for the lining. But I'm stuck on the directions and can't figure out what to do next. Solution? Sewing buddy Midge. She made a copy of this pattern and has fabrics to make this purse for her granddaughter. I think I'll have to wait for her to get to this stage and then show me what to do. I'm great with flat stuff but fall apart when there is any shaping involved. These fabrics are the results of my run out to quiltfabric.com in Willowbrook. Left: a batik with more blue than black. Next: another batik but with more black (these are very similar fabrics. Next: a blue-black mottled fabric that is very rich. On the right is a pure black fabric. So now the issue is which one Christopher will prefer. My goal is for Chris to make a decision about which fabric without driving from Evanston to LaGrange. However,it's so hard to tell from photos. This second picture shows all three of these fabrics next to an edge of the quilt banded on both the top and bottom with black. But it's hard to tell. Clicking on any of these photos will enhance the details. I've had a good day of sewing and almost feel as if I'm back in the saddle again. Thus, the song title! Actually this picture is markedly different from the one posted last week. Here you are looking at 9 rows of a quilt - last week it was 63 individual blocks. So this quilt is well on its way. And again I am surprised at how lovely it's going to be. The picture below is an indication of some of the finishing details. One of Bradley's shirts was a terrific black-patterned fabric, and we are using that as an inner one-inch border. The outer four-inch border is going to be - well, we don't know what it's going to be because I haven't yet shopped for the fabric. Ideally it's going to be a cotton with a texture/pattern of navy and black. And the quilt backing will be solid black. Another one of Bradley's shirts had some terrific silver buttons. Chris is going to determine where they are going to go on this quilt - he's thinking along the outer borders and already has the spacing in mind. Despite this being a difficult personal week with my mom in and out of the hospital, I have great expectations for this week to come! Some time with Dr Husqvarna is just what I need. Once I get this pattern and its eleven pieces out, it's hard to put it away. There was enough fabric left over from Paula's Carolina Carry-All to do this purse. I'll happily use this purse this spring. But now I'm ready to put away the purse stuff, do some clean up, take a deep breath, and start Chris's quilt. I took one of my own purses to Kenya with me and loved it for its size, zippered compartments, and hidden pocket. So I made another one of this pattern and love how it turned out. Instead of using a batting in the purse, I used a new product, Soft and Stable, by byannie.com. And this product is a winner. It's easy to sew through and it softly holds its shape. I've discovered that the inside of purses must be light-colored in order to find things. And for a while I tried to talk myself out of the importance of zippered compartments as a way to avoid zippers. Luckily I have mastered these zippers because both of these compartments contribute to the success of this purse design. I'd show you the hidden pockets except they are very cleverly hidden in the brown sides! 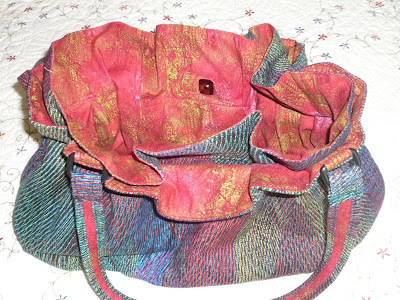 I want to get back to some "flat" things for me, like quilts, but when I have this purse surge going, I have to give in to it. Luckily today is a clear day. Tomorrow I'll start piecing together Christopher's quilt! Christopher LeGrand was in the studio this morning. The pillow he commissioned from Bradley's shirts for his brother Michael is ready, and Chris is putting in the mail to Mike in Texas. This pillow - 12" x 16" - is made from the cuffs of Bradley's shirts. The back of the pillow is one of the shirt backs. And there is one of Bradley's trademark Fleur-de-lis buttons in the center of the front. The words on the back on this pillow are the same as the ones on the back of sister Linda and Mr. and Mrs. LeGrand's quilts. Chris worked on the layout of his own quilt - I had already cut the 9.5" squares from the shirts he brought over last week. This final layout took us two hours and is one we are both at peace with. It's not easy figuring out what isn't right, but we both knew this layout is the one. We also know there is going to be a narrow inner border of black from one of Brad's shirts that has an interesting black-on-black design. The outer border is one I need to shop for - a very dark navy/black fabric, perhaps a batik. 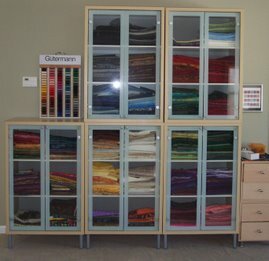 I'll go to quiltfabric.com in Willowbrook to find what I need. Bradley's birthday was this past week. He would have been 45. It was a difficult week for his parents and for Christopher, Linda, and Mike. And every future February 9 will be difficult as well, I expect. But after these moments of intense grief, there are also moments of peace. Today in the studio with Chris, Mike, and Brad was one of those peaceful moments. My cousin Jerry is a craftsman both in his vocation (engineering) and his avocation (wood working). I want spoons from him, and this casserole carrier is on its way to the Kansas White House. Now he'll be able to see exactly how I want to use these spoons. The discovery I made today is that the spoon handle needs to be almost 10" long. A spoon that is 13" in length would be ideal. But I have no idea whether what I'm asking him is reasonable or feasible. 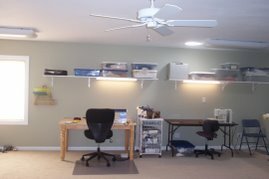 Check out this blog entry from last June - Jerry gave me some of his work, which I treasure and use. Aren't these fabulous? Any fabrics I buy must be washed before they go into my stash. Normally I don't enjoy laundry chores - unless they involve new fabrics. I find it very satisfying as I take fabrics out of the dryer and fold them. It's an extra excuse to touch and study and plan what I want to do with these. Can you tell I've just returned from Africa? All of these read "ethnic" to me. I'm not a "bricks and mortar" shopper - I do best when I'm e-shopping. eQuilter.com and Hancock's of Paducah are two of my favorite sources for fabrics. Decent sale prices and quality! Here's a fabric I'm sad to say goodbye to. It's a rich lovely paisley with some gold in it. I think I made some Mors bags for Christmas a few years ago from this. And as so often happens, once I start to use a fabric, I really develop a love for it. There is less than a quarter yard of this. And it definitely fits into buddy Cecilia's house. Her birthday is this Saturday. So here is a set of Mug Rugs (thank you, Rachel, for that idea) that I think she'll use. The batting is actually a thermal batting designed for hot stuff. Good thing she isn't a blog reader, eh? Christopher LeGrand was back in the studio. Before Christmas we did quilts from his brother Bradley's shirts for their parents and sister and a pillow for their aunt. These Christmas presents which celebrated Bradley's life were warmly received by the LeGrands. In fact, I received lovely tear-stained notes from Mrs. LeGrand and Chris's sister Linda. This morning Chris showed me the binder he made from my blog entries, which accompanied these quilts. Even I was moved at the loveliness of this entire gift package. The focus of today's work is creating a quilt now for Christopher himself. The majority of these shirts are black, but you can see a couple of lighter shirts. It's going to be a challenge to create a design from these shirts. Chris is coming back next Sunday to work on this task. And from the cuffs of these shirts brother Mike will get a pillow. Of course I'm glad to see Christopher again, but I'm even happier that his quilt will give completion to the LeGrand family quilting project. This purse is finished, and I'm happy with the way it turned out. I love the color, and I love the design. In the second picture I'm trying to show one of the two very handy hidden pockets. And you can see that there is a snap closure at the top of the purse. There's just one problem. These colors - although lovely - aren't mine. And this purse - although terrific - just isn't my style. Hmmmm, who's color and style is this. I think this must go to Paula. Are you reading, Paula? What do you think? Here is the one Midge did, and I love these fabrics as well. Now we have to figure out what to do next - parallel sewing on projects is something we enjoyed doing a lot. I love how the media nickname events. Snowmageddon was my second favorite. It's amazing how quickly we have recovered from this blizzard. Can you tell from this picture that the snow is 24" high? My purse is starting to take shape. Tomorrow will be the completion day. Quilting, a distinctly American art form, and Black History are intertwined. Quilting reflects what is/was happening in society. Some of the best known quilt blocks, like the Log Cabin and the Bear's Paw, were used as messages for the Underground Railway. A Log Cabin quilt on a clothes line meant that up ahead there was a safe house. A Bear's Paw quilt was a sign to follow the path of the bears for a route through the mountains. Just as the hymn "Wade In The Water" meant to abandon the path and walk in or near the water, a Monkey's Wrench quilt meant it was time to collect tools that would be needed on the journey to freedom. The Sugar Camp Quilt, The Lost Quilter and The Runaway Quilt. One character, a cantankerous old man, was actually a gentle man with a soft heart who needed to play the cranky horrible old man in order to hide his role in the Underground Railroad. A few years ago a small handful of women from the Lawndale Christian Church began quilting, and we worked on a sampler of blocks from Eleanor Burns's book The Underground Railroad Sampler. This sampler included the Log Cabin, Jacob's Ladder, Bear's Paw, and Monkey Wrench. It was a great project because it reinforced skills with sashing, borders, and binding as well as serving a connection to our pasts. A rich tradition in quilting is the story quilt. Instead of a blocked, pieced quilt, a story quilt is often applique, heavily detailed, and literally tells a story. At the other end of the quilting spectrum is the community of quilters from Quilters of Gee's Bend. They captivated the quilting and artistic world with their primitive and graphic quilts. February is always a good month to reflect on the rich history of American quilting. I think I'll honor this month with a liberated scrap quilt. At the Jinny Beyer website I found this pattern and fabric kits in 2 colorways. I gave buddy Midge one of the kits, and I gave myself the other; we shared the pattern and directions. And today we got started. 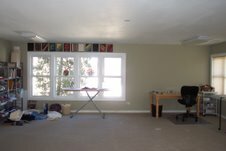 One of the reasons I like doing quilts and wall art is because they are flat. Patterns, like this one, are a bit scary, because these projects are actually three-dimensional. Here's what this bag looked like at 9 this morning. Bag front, back, vent, pockets, straps, lining bits, facing, fusible fleece, and five pages of directions. Here's where I am now. Tomorrow I'll work on the lining, assuming I can read and follow directions without Midge. This blizzard has us all snowed in!